Click the logo below to go visit our Facebook Page! What is Buy In Ashland County? Why should we by local? Mom and Pop shops rely on the customers within their town to keep coming back on a daily or weekly basis. Big box stores have much more financial stability than your local shops, so without a constant stream of revenue, you may see your favorite local store go out of business in no time. Ca$h Mobs are special "flash mobs," but instead of singing and dancing, we spend money (minimum of $10 per person) at a local businesses that make ALL of Ashland County special!! We will announce on Facebook (@Buy In Ashland County) details of the Ca$h Mob! OR send us your email! 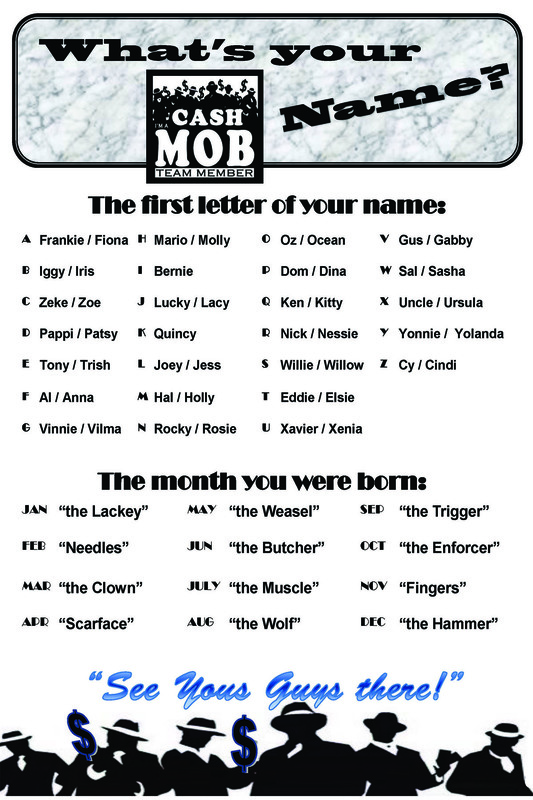 Pick out your Ca$h Mobster name: see chart below -or- pick one of your own! On the Ca$h Mob day, come prepared to spend $$ - remember you may need to wait in line, it is a mob, remember...have some fun & remember to sign the "You've Been Ca$h Mobbed Poster" for the store! And that is it! Ca$h Mob Days will be held at local stores all over Ashland County! Watch for it!